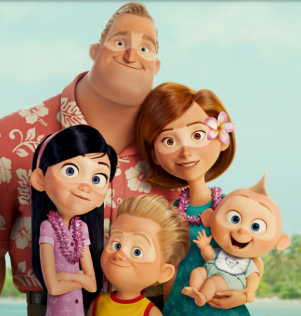 Disney Vacation Club Incredible Family Vacation Sweepstakes – Win a trip to Walt Disney World! 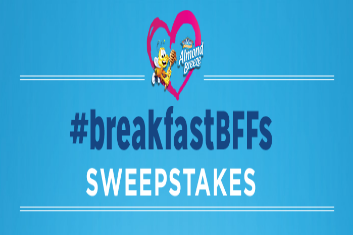 Win a trip for 8 to Walt Disney World! 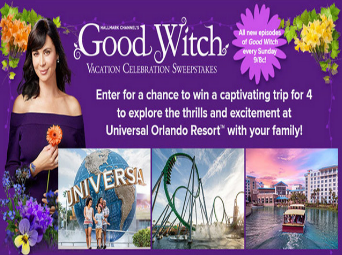 ENTER SWEEPSTAKES HERE – Disney Vacation Club Sweepstakes page. ENTRY LIMIT – There is a limit of one (1) Website Entry per Entrant, plus up to (4) bonus Entries during the entire Sweepstakes Period. ELIGIBILITY – The Disney Vacation Club Incredible Family Vacation Sweepstakes is open only to individuals who are legal residents of, and physically located within the 50 United States and the District of Columbia, who are at least 18 years of age, or the age of majority in his/her jurisdiction of residence, whichever is older, as of date of entry. 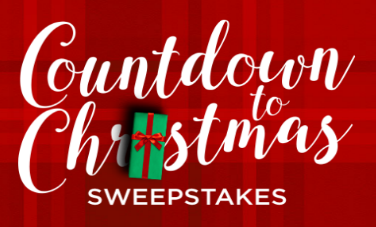 SWEEPSTAKES ENTRY PERIOD – The Sweepstakes period begins on 12:00:00 PM (noon) Eastern Time (“ET”) on May 15, 2018 and ends at 11:59:59 PM ET on July 19, 2018. 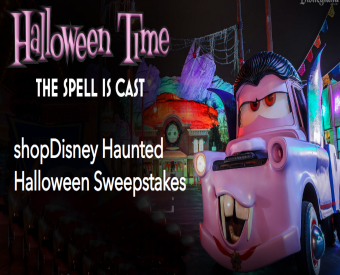 PRIZES – The Winner will receive a five (5) day/four (4) night stay at Copper Creek Villas & Cabins at Disney’s Wilderness Lodge in a 2-bedroom Villa for the Winner and up to seven (7) companions (each, a “Guest”). Prize includes: [a] Room accommodations consisting of one (1) 2-bedroom Villa (with a maximum of eight (8) persons) for four (4) nights at Copper Creek Villas & Cabins (dates are subject to availability); [b] Round trip coach airfare for eight (8) people (Winner and seven (7) Guests) between the major gateway airport closest to the winner’s residence (as determined by Sponsor in its sole discretion) and the Orlando International Airport; provided, however, if the Winner resides within 250 miles of Copper Creek Villas & Cabins at Disney’s Wilderness Lodge at Walt Disney World® Resort, in Lake Buena Vista, Florida, air fare will not be provided; [c] Eight (8) round trip ground transfers between the Orlando International Airport and Copper Creek Villas & Cabins at Disney’s Wilderness Lodge via Disney’s Magical Express Service; provided, however, if the Winner resides within 250 miles of Copper Creek Villas & Cabins, ground transfers will not be provided; [d] Eight (8) 3-day Walt Disney World® theme park tickets with Park Hopper® Option; and [e] a check in the amount of USD $7,100 (check will be drawn on US funds) made payable to Winner to help offset, but not completely eliminate, the tax liability associated with accepting the prize. The ARV of the prize is $18,760. KIRO 7 Silverwood Spring Giveaway 2018 – Win tickets to Silverwood & more! 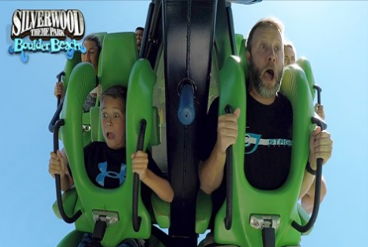 Win 4 tickets to Silverwood, $100 Silverwood cash & more! ENTER SWEEPSTAKES HERE – KIRO 7 Sweepstakes page. ENTRY LIMIT – There is a limit of one (1) entry per person and per email address during the Sweepstakes Period. ELIGIBILITY – The Silverwood Spring Giveaway 2018 (the “Sweepstakes”) is open only to (i) legal residents of the state of Washington, Oregon, Idaho, or Montana; (ii) who are 18 years old or the age of majority in their state of residence at the time of entry. SWEEPSTAKES ENTRY PERIOD – The Sweepstakes will begin at 12:00 a.m. PST on April 16, 2018 and end at 11:59 p.m. PST on May 13, 2018. (d) a two (2)-night stay for the winner and guests at Triple Play Resort (one room with two queen beds, room rate and taxes only). The total approximate retail value of the prize is $750, which may vary depending upon dates of travel. NO TRAVEL IS PROVIDED AS PART OF THE GRAND PRIZE. THE GRAND PRIZE MUST BE USED BEFORE AND WILL EXPIRE ON SEPTEMBER 25, 2018. Winner must use the tickets and hotel stay during the 2018 Silverwood season (May – September). 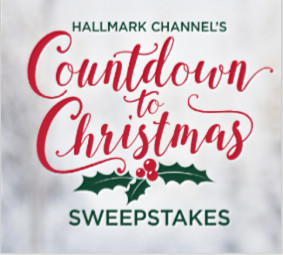 Hallmark Channel Countdown to Christmas Sweepstakes – Win a family getaway! Win family winter wonderland getaway for four (4 winners)! SWEEPSTAKES ENTRY PERIOD – Entries must be received between Monday, October 23, 2017 at 9:00:00 AM PT and Monday, December 25, 2017 at 8:59:59 PM PT. PRIZES – Grand Prizes: Four (4) Grand Prize winners will each receive one (1) family winter wonderland getaway for four (4) (i.e., winner and three (3) guests) with Delta Vacations® including airfare and a stay at a Gaylord Hotels resort plus a Balsam Hill prize package (each, a “Grand Prize Package”). One (1) Grand Prize Package will be a trip to the Gaylord Opryland Resort in Nashville, TN; one (1) Grand Prize Package will be a trip to the Gaylord National Resort in National Harbor, MD in the Washington, D.C. area; one (1) Grand Prize Package will be a trip to the Gaylord Texan Resort in Grapevine, TX near Dallas; and one (1) Grand Prize Package will be a trip to the Gaylord Palms Resort in Kissimmee, FL near Orlando. Actual value of the travel portion of each Grand Prize Package depends on location of winner’s departure airport, fares at time of travel and land accommodations. If actual value of the trip is lower than ARV stated herein, the difference will not be awarded. 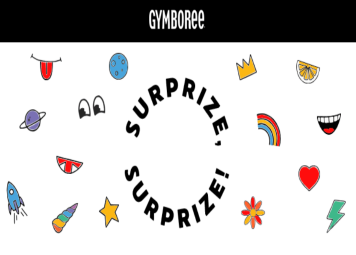 Winner will not have the option to select the Grand Prize Package but Sponsor will select, in its sole discretion, the particular Grand Prize Package location to be awarded to winner. Round trip coach airfare for Grand Prize winner and three (3) guests from the nearest major U.S. gateway to the destination. Winner and guests are responsible for transportation to the nearest major U.S. gateway airport, as designated by the Sponsor, at their own expense. If winner resides within a 200-mile radius of the prize-destination, ground transportation may be provided. Accommodations at a Gaylord Hotels resort in the city specified, for two (2) nights/three (3) days in one (1) room, quad occupancy (selection of accommodations is at the sole discretion of Gaylord Hotels). Four (4) tickets to ICE! featuring larger-than-life holiday sculptures and two-story slides, all hand-carved from 2 million pounds of ice. One (1) Gingerbread House Decorating Corner experience (one gingerbread house kit per room). One (1) Balsam Hill™ Christmas Decorating Set valued between $433 and $464 (retail value). Sponsor’s choice of one (1) of the following sets: Balsam Hill Silver and Gold Décor Set, Balsam Hill Christmas Cheer Decorating Set, Balsam Hill Brilliant Bordeaux Decorating Set, or Balsam Hill Nordic Frost Decorating Set. Round trip airport transfers to/from resort and airport in destination city. ARV of Grand Prize Package with Balsam Hill Silver and Gold Décor Set: $3,464; ARV of Grand Prize Package with Balsam Hill Christmas Cheer Decorating Set: $3,495; ARV of Grand Prize Package with Balsam Hill Brilliant Bordeaux Decorating Set: $3486; and ARV of Grand Prize with Balsam Hill Nordic Frost Decorating Set $3,494. News Tribune “Play Ball” Tacoma Rainiers Sweepstakes – Win tickets to a Tacoma Rainiers home game! 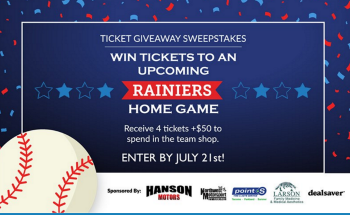 Win 4 tickets to an upcoming Tacoma Rainiers home game & more (3 winners)! ENTER SWEEPSTAKES HERE – News Tribune Sweepstakes page. ELIGIBILITY – You must be 13 years of age or older at time of entry to be eligible for this contest. The News Tribune/Seattle reserves the right to restrict the local winners to only persons whose primary residence is within a 60 mile radius of 1950 South State Street, Tacoma, WA 98405. SWEEPSTAKES ENTRY PERIOD – Sweepstakes ends July 21, 2017. PRIZES – Three lucky winners will be entered to received 4 tickets to an upcoming Rainiers home game PLUS a $50 gift card to the Rainiers team shop. 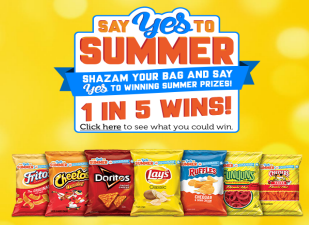 Lay’s Say Yes to Summer Instant Win Game – Win a PGA Championship Trip or other great prizes! Win a PGA Championship Trip or other great prizes! ENTRY LIMIT – Limit one (1) Play per day per person/email address/phone number, regardless of method of playing. ELIGIBILITY – The Game is open only to legal residents of any of the 48 contiguous U.S. states or the District of Columbia, who are 18 years of age or older at the time of participation. SWEEPSTAKES ENTRY PERIOD – Game begins at 12:00:00 p.m. (noon) Central Time (“CT”) on May 15, 2017 and ends at 11:59:59 p.m. CT on July 14, 2017. 8 total; 2 prizes will be awarded for Entry Period 1, Entry Period 2, Entry Period 3 and Entry Period 4. / PGA Championship Trip Prize – Two (2) night stay (August 11, 2017 and August 12, 2017) for winner and winner’s guest at Quail Hollow Club in Charlotte, NC; two (2) Wanamaker Club passes (including food and beverage vouchers; as determined by Sponsor, in Sponsor’s sole discretion) for August 12, 2017 and August 13, 2017 at the PGA Championship. In the event of the 2017 PGA Championship is cancelled for any reason, including but not limited to inclement weather, the Wanamaker Club passes and food and beverage vouchers will not be awarded and no further compensation will be provided. Travel dates: August 11, 2017 – August 13, 2017. ARV: $3,350.00 each. Winner may take a cash alternative of $2,680.00 in lieu of the above-stated prize. NOTE: If the 2017 PGA Championship is cancelled after any travel arrangements/costs have been incurred; only the air transportation and accommodations portion of the prize shall be awarded.